What an alien does to your system can be pretty irritating. Disabling system functions, high memory usage, internet bandwidth stealing to name a few. Other times, it can be dangerous as well; stealing passwords or bank and credit card information. The best way to avoid infecting your PC with these aliens is to block their source of entry into your PC. Usually, these aliens propagate through Pen Drives, EMail, Illegal downloads, Torrents, and other means of data transfer such as CDs and DVDs. Use a good anti-virus software, update it regularly and scan your system frequently. This does 25% of the work. A good anti-virus software with a real time scanning ability will detect most of the infection before it occurs, thereby saving you the trouble even before it erupts. Update your Windows OS with all the security releases from Microsoft. This is pretty essential, but I haven’t seen many high-priority updates since SP2. So, if you have SP2, I guess that’s update enough; but always update if you can. Always watch the task manager. Be aware of the number of processes that your system usually runs. This could help you detect any unwanted processes running in the background. Always scan any file that you download from the internet or your email inbox before executing it. Aliens in pen drives rely upon autorun to affect your system. As soon as you insert an affected pen drive and double click on its icon in My Computer, be assured that your system is now infected. The best way (probably the only good way) to stop this is by disabling autorun. You can do this by manually editing the registry which is not always the best option. Instead, you could download TweakUI, released by Microsoft for tweaking the performance and related issues of Windows XP. Download it from Microsoft Download Center and install it. Pretty straight forward installation and shouldn’t be any problem. Run it. 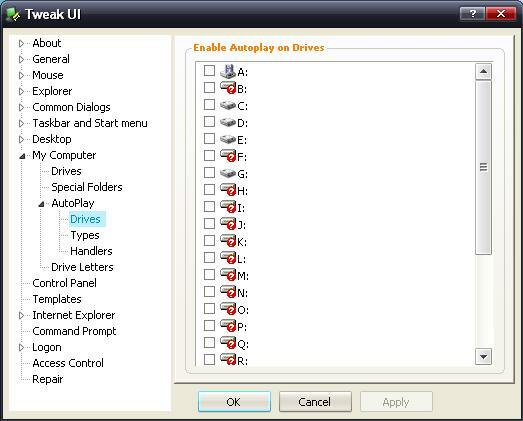 This will disable autoplay for all drives and hence, when you insert the device, your PC will not be infected. But it is not over yet. As soon as you connect a device, always right click on its icon in My Computer and click on Open. Better yet, use Windows Explorer to view the contents. Enable option to view hidden files and folders. Delete the ‘autorun.inf’ file if present and any suspicious ‘.exe’ files if found. Your pen drive is now clean. Follow these steps every time you use the pen drive. These steps are usually required if your anti-virus software fails to detect/resolve the threat.